NEW ORLEANS — Professors in the McCombs School of Business should give Avery Denning extra credit for determination and gut instinct. The University of Texas business student from Chicago pestered her parents throughout December for Sugar Bowl tickets. She absolutely, positively had to be in New Orleans on New Year’s Day. Finally, they relented. “Christmas morning, they bring out one last Christmas present from behind the tree and it’s three boxes,” Denning said. “It’s a box of Mardi Gras beads, a bowl full of sugar and a Texas flag. “Oh, my God, I’m so excited!” Avery shouted. Lots of Texas fans were shouting all kinds of things after the Big 12 championship game loss to Oklahoma. But the 15th-ranked Longhorns still landed in the Sugar Bowl for the first time since the end of the 1995 season. Texas (9-4) faces fifth-ranked Georgia (11-2) at 7:45 p.m. Tuesday in a matchup that could signal whether coach Tom Herman’s program is a national player again. Texas hasn’t won 10 games in any season since 2009. Austin residents Lynnette and Danny Caswell weren’t going to miss this, either. They bought bowl tickets and made hotel arrangements before the game was announced, figuring it was going to be either the Sugar Bowl or the Alamo Bowl. “That’s why we happened to be at the hotel where the Georgia team is staying,” Lynnette Caswell said. For these 27-year UT season ticket holders, who put up with three straight losing seasons from 2014-16, it’s been well worth the wait. Same goes for Arwen Dotson, who was raised in San Antonio, spent 25 years in California and now lives in Slidell, La. 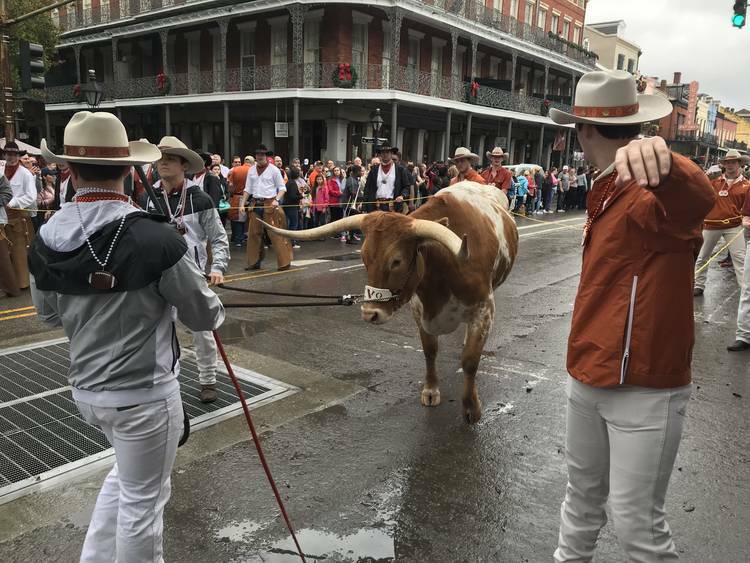 On Monday, the Sugar Bowl staged a parade down Decatur Street featuring the UT and Georgia bands, mascots Bevo XV and Uga X, cheerleaders and some area bands and performers. People taking selfies inside Jackson Square with President Andrew Jackson’s statue in the background came out and lined the street. The parade was a perfect time to get in line at Cafe Du Monde for a bag of warm beignets. Texas fans weren’t all that obvious initially, as fans stayed out of the off-and-on rain showers. But when UT band members started strutting down Decatur and shouting, “Beat the hell out of Georgia!,” business picked up. Grant Dupertuis and his fiancé Alley will be on opposite sides of the aisle in the Mercedes-Benz Superdome. Grant, a Texas fan living in Atlanta, is all burnt orange. Alley was a former Georgia Dance Dawg as part of the school’s spirit team. Texas and Georgia have agreed to a home-and-home matchup in 2028-29. But why wait? Tyler residents Terra and Keith Koehler both hope this is the start of a long run of Longhorns success. If receivers Lil’Jordan Humphrey and Collin Johnson both return for their senior seasons, “I think the offense should be fine,” Keith Koehler said. The Sugar Bowl is a terrific reward for this team, several fans said. It’s a lot better than the Alamo or Texas Bowls. And it’s not a bad way to end the year, even after the disappointment against the Sooners. They reached the CFP but got beat by Alabama in the Orange Bowl.